Da Nang has launched a campaign to call on the community to ‘Say No’ to single-use plastic products to deal with pollution and waste treatment costs. Vice Chairman of the municipal People’s Committee Nguyen Ngoc Tuan said the campaign would focus on raising public awareness of plastic waste. Tuan said the campaign also called for household rubbish to be separated to boost recycling and promote the re-use of plastic bags. “The city produces 870 tonnes of garbage each day, of which 95 percent is collected, and only 10 per cent (mainly plastic waste) is recycled. 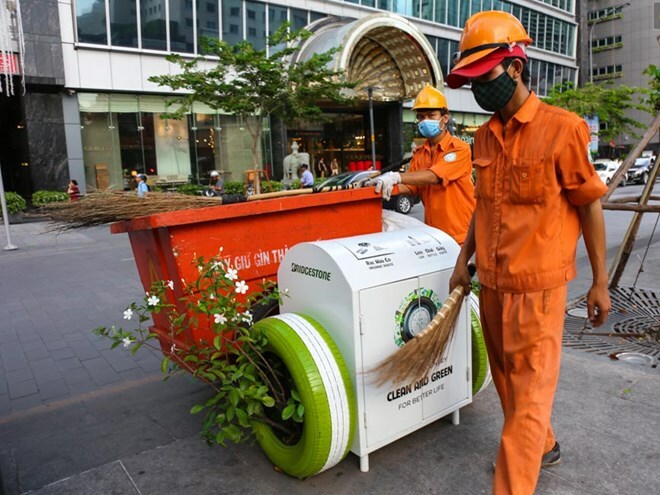 “Da Nang has cooperated with the Asian Development Bank (ADB) to design technology for waste treatment and sustainable development towards a ‘green’ city by 2025,” Tuan said. He added that the city had called on investors to build its first solid waste treatment plant for recycling, compost, dumping and gas collection in Hoa Nhon commune. The city reserves an annual fund of 333,000 USD for waste collection and treatment, and almost 90 percent of the city’s rubbish currently goes into landfill sites. In 2015, Da Nang opened the Khanh Son dump with a capacity of 200 tonnes per day. The plant can generate power from waste using incineration technology. The same year, the city, in cooperation with Chikujo in Japan’s Fukuoka Prefecture, started a pilot project to recycle organic waste into environmentally friendly liquid fertiliser. Japanese experts from the Tokyo-based EX Research Institute also urged Da Nang to apply advanced technology in waste treatment to help the city deal with overloaded dumps. At least 80 per cent of daily waste would be completely treated if the central city applied smart management of solid waste, according to Satoshi Sugimoto, a consultant from Japan’s Overseas Environmental Cooperation Centre. According to the Ministry of Construction, Vietnam discharges 19,000 tonnes of rubbish every day, of which 16 percent was plastic waste, and at least 4,000 tonnes of rubbish from the sea washes up on the city’s beaches every month during the rainy season.